Here is another figure from the FireForge Mounted MAA set - painted up as Aymer de Valence, the 2nd Earl of Pembroke. He served under both Edward I and Edward II in Flanders and Scotland. He defeated Robert the Bruce at the Battle of Methven in 1306. He tried to keep the peace between Edward II and his opponents headed by Thomas of Lancaster. When Edward's hated favorite Piers Gaveston was exiled and later returned to England, it was Aymer de Valence who captured him. Lancaster had Gaveston removed from his charge and executed. This breach of protocol seriously damaged the relationship between De Valence and Lancaster. 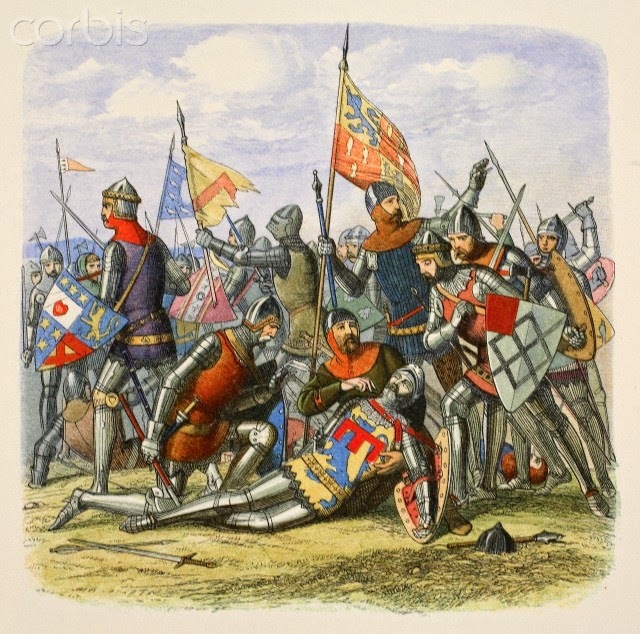 The Earl was at the Battle of Bannockburn in 1314, where he led Edward II to safety after the English defeat. A few years later while on a papal embassy he was captured and released after paying a financially ruinous ransom. In 1324, he was in France on diplomatic mission when he collapsed and died, possibly of a heart attack. However, some say he may have been murdered as retribution for his role in the execution of Thomas of Lancaster in 1322 for treason. Those red blotches about his arms are supposed to be little birdies - or martlets in heraldic terms. The mail is rather nicely sculpted too. Although I had mentioned in the previous post that those mounted yeomen would be my last painting project for the year, I felt compelled to paint Aymer up as I really like his arms. 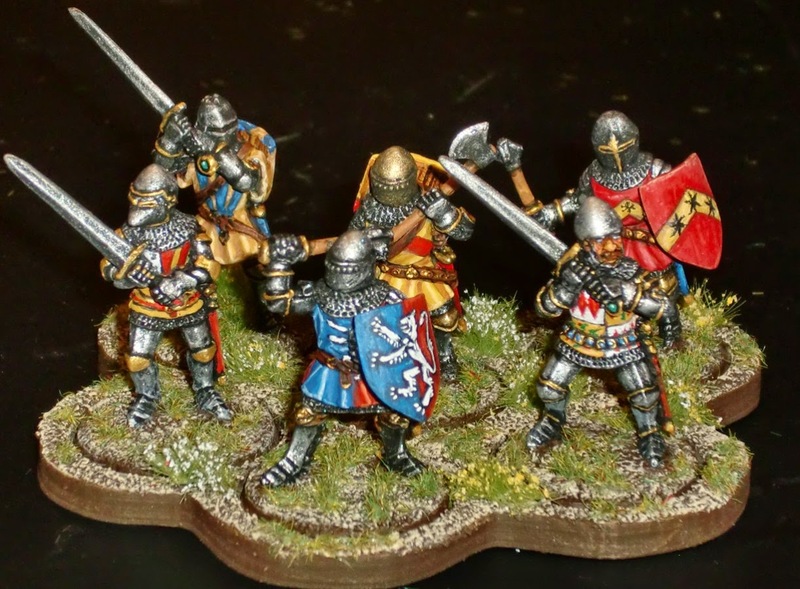 I painted up a 120mm Velinden knight in the same arms some years ago. The colors and pattern are simple yet striking. 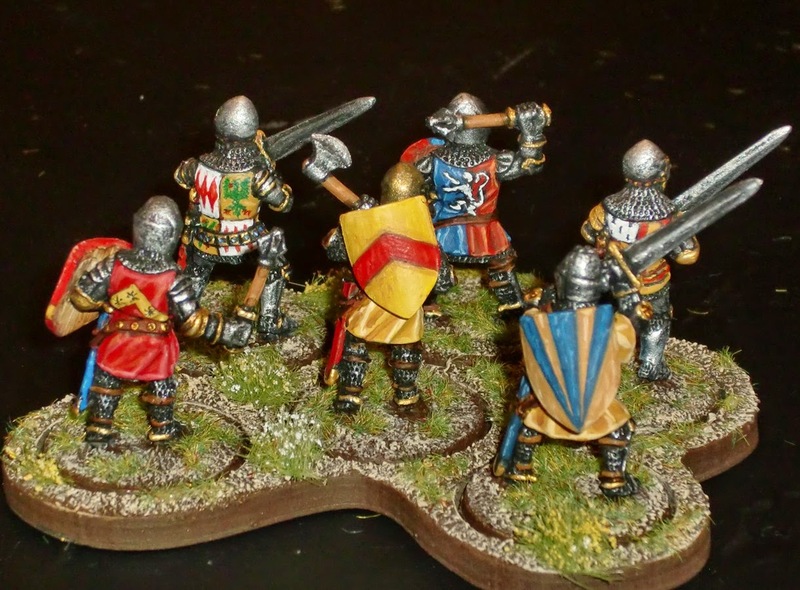 Here is a unit of Mounted Yeomen with Bows for Lion Rampant. Granted it is unlikely the longbow was fired from the saddle, but I wanted to have the "look" for the game. These guys will be upgraded as Expert and will be able to Skirmish move and fire without the -1 Shooting penalty. The horses and riders are from the Fireforge Mounted Men at Arms kit with Perry WotR and GW Empire Huntsmen arms and bows. Their long swords were scalpeled off. The mail from their lower legs was also shaved, and Testors glue applied over it to smooth it off, and painted as riding boots. Several of the mail coifs were also similarly converted to look like cloth hoods. They were painted rather quickly with basic colors and followed by Minwax staining. The riders' coats were given a bit of highlighting afterwards. They are a decent match with Black Tree Design as the horses are on the taller side. The kettle helmets are particularly nice too. These are likely the last figures to be painted for 2014. I have several projects already in mind for the new year - one being a 1/8th re-release of an old Aurora kit picked up off of ebay. The original goes for a ridiculous amount, but this one was less than $30 USD with free shipping. The intention is to build the kit to represent Richard III - a crown will have to be fabricated. Here's the still wrapped box with some OG 28mm figures in front of it for scale. Here's a Perry figure painted up as the standard bearer for the famous former guerrilla leader turned knight, and finally Constable of France, Bertrand du Guesclin. Bertrand du Guesclin was the eldest son of a minor Breton noble who took to the martial life from an early age. He initially served under Charles of Blois during the Wars of Breton Succession (1341-1364). During this time he also fought against some of the more famous English knights, including the Captal de Buch, Hugh Calveley, Sir John Chandos, and the Black Prince. Du Guesclin defeated the forces under the captal at the Battle of Cocheral in 1364. The battle cry for the French forces was, "Notre Dame Guesclin!" as he was nominated by his peers to be the overall commander. At the Battle of Auray, where Charles of Blois was killed, du Guesclin was captured by Sir John Chandos. The arms of the standard bearer are conjectural - being made up the arms of Brittany and France Modern. 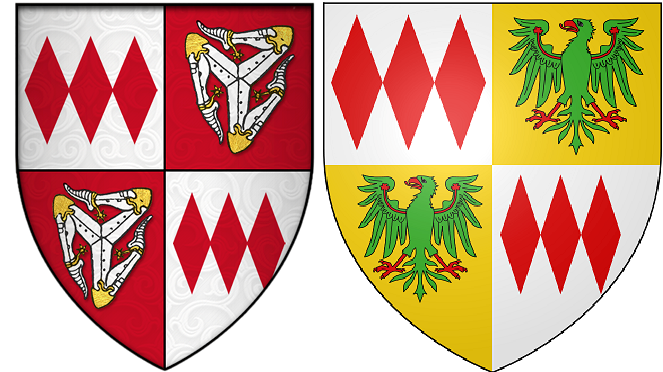 Du Guesclin's arms are a two-headed eagle with a red bend. The excellent flag was downloaded from the free site Dansk Figurspilsforening. This flag as well as numerous other HYW flags was created by the talented Rune Kramer. At the Battle of Najera in Spain, du Guesclin was once again captured - this time by the Prince of Wales. King Charles V of France ransomed him and later made him Constable of France. Du Guesclin died of illness during a siege in 1380. 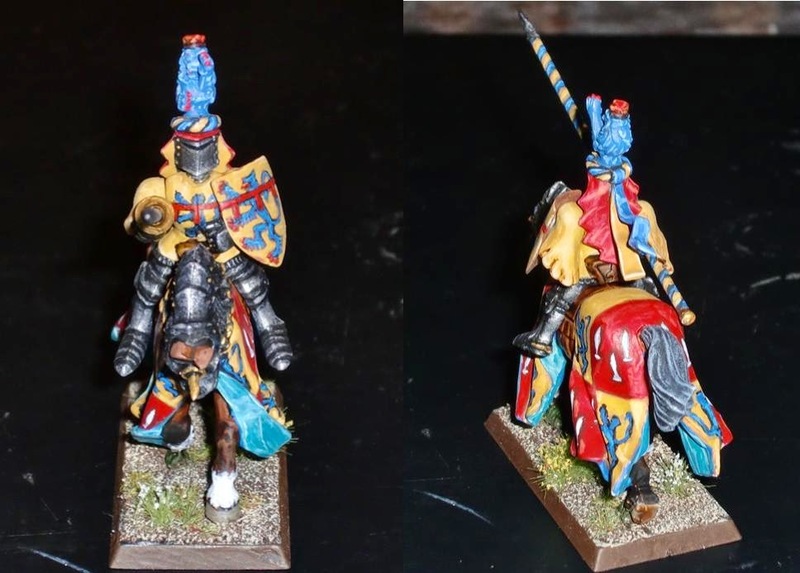 Here's an old GW Bretonnian knight painted up as Sir Henry Percy, called Hotspur by the Scots for his eagerness on the battlefield. He was knighted by King Edward III in 1377, the same year the king died. He served under King Richard II and campaigned in Scotland and France. He was captured by James Douglas at the Battle of Otterburn in 1388, and later ransomed by King Richard II. After Richard II was deposed, he served under Henry IV and fought at Homildon Hill in 1402, where he captured Archibald Douglas. Sir Henry died at the Battle of Shrewsbury in 1403 while leading a rebel army against Henry IV. Sir Henry's horse trapper has the quartered arms of Percy (blue lion rampant on a gold/yellow field) and de Luci (three white lucies, or pikes, on a red field). His tabard and shield bear just the Percy arms with a red label as the eldest son. I was inspired to paint up Sir Henry after a stein I just picked up off a ebay which has a depiction of him. I need to get some dark beer to test out the stein. Finally, here's a nice 19th C. illustration of Sir Henry at the Battle of Shrewsbury, after receiving a mortal wound to his head or neck. 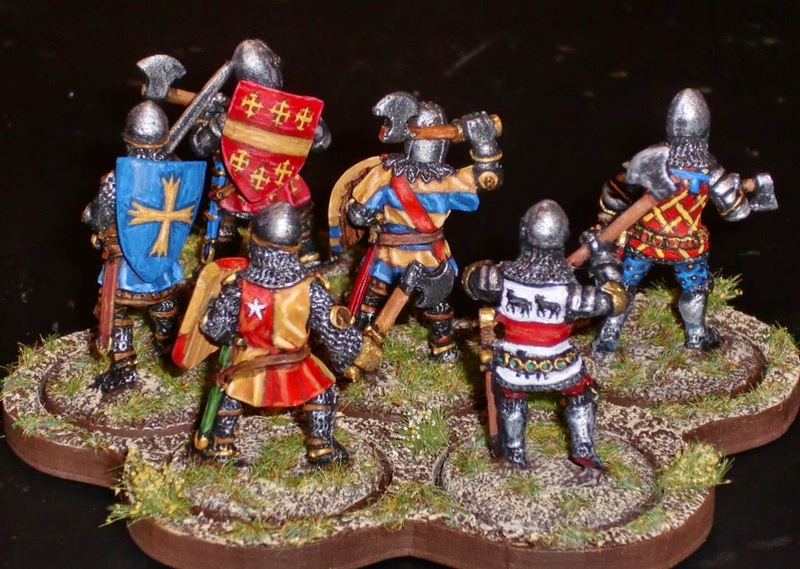 Here are the foot knights that will be part of an English HYW retinue for Lion Rampant. These are all BTD figures from their Early and Late-HYW range. As they were already posted individually or in pairs recently, I won't belabor their respective characters, but suffice to say they are all famous knights who served under Edward III and/or the Prince of Wales. They are individually based on magnetic 25mm rounds from Gale Force 9. The movement trays are from Litko with steel paper inserts. 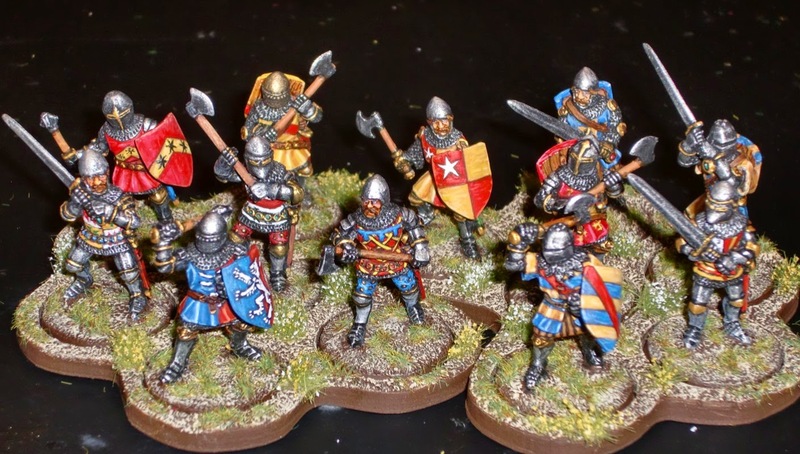 For Lion Rampant, foot MAA units cost 6 points per unit of 6 figures. They're pretty potent in melee - as they should be. You can have up to 4 units of the same type as long as the total points don't exceed 12 - so in the case of foot MAA, two units will max out the points - which is what this retinue will have. Thanks for following this project, and hope you enjoyed the posts. 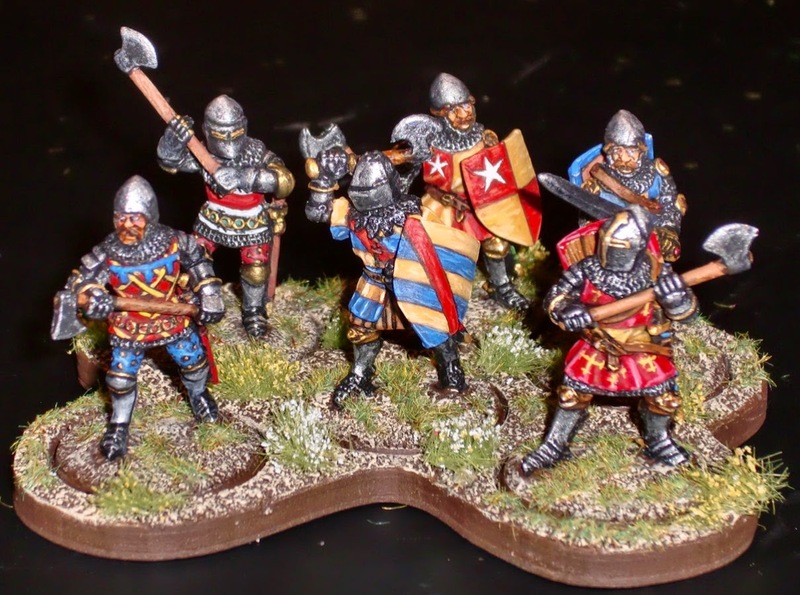 I hope to get these guys in a game soon - although I still want to build a unit of mounted yeoman with bows for this retinue. The arms of Sir Guy are: Or (gold/yellow) three piles azure (blue). The "piles" motif has been described as either spear or arrow heads. The arms of Sir Thomas are based on the ones attributed to John, Lord of Norwich. 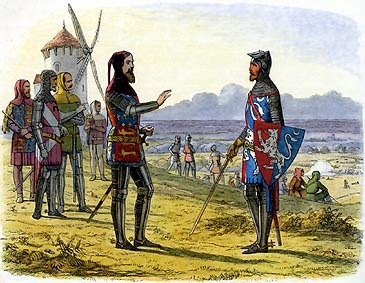 According to Froissart’s account of the Battle of Crecy, it was Sir Thomas Norwich who reported the predicament the Prince of Wales was in to his father Edward III. To which Edward III is supposed to have replied to let his son win his spurs that day. As I couldn’t find the coat of arms for Sir Thomas himself, I’ve used the ones credited to John, Lord of Norwich - also present at Crecy. A 19th C. illustration of the scene shows Sir Thomas with the colors of the field reversed. These two complete the 12 BTD foot knights for two units of MAA in an English HYW retinue.